Two large meteotsunami wave events on Lake Michigan impacted the Chicago coastline within 10 days of each other in 1954. Initial data analysis suggested that the fatal first event (June 26) was caused by a Proudman resonant non-trapped wave, while the second event (July 6) was caused by Greenspan resonant trapped edge waves. In this study, a numerical hydrodynamic model was used to reveal the detailed behavior of these events. For both events, the atmospheric pressure and wind perturbations were found to be essential to explain the magnitude of the wave activity, in contrast to the initial conclusions that the waves were primarily pressure-driven. In the June 26 meteotsunami, Proudman resonance wave was the primary cause of the destructive wave, though the storm also generated edge waves which persisted for many hours, hindering rescue efforts. The maximum wave heights for the July 6 event were found to be the product of a superposition of edge waves and non-trapped waves rather than purely edge waves as originally thought. The results from these events demonstrate the enclosed Lake Michigan basin retained and focused wave energy, leading to their large magnitude, long duration, and destructive nature. This work was supported by the National Science Foundation’s Graduate Research Fellowship Program, the Cooperative Institute for Limnology and Ecosystems Research Long-term Great Lakes Fellowship, and UW-Madison/UW-Milwaukee Intercampus Research Incentive Grants Program. The authors would like to thank Dr. David Schwab at the University of Michigan-Ann Arbor and Dr. Eric Anderson at NOAA-Great Lakes Environmental Research Laboratory for the advice and discussion on meteotsunamis in the Great Lakes. The authors would also like to thank the two anonymous reviewers whose comments greatly improved the manuscript. 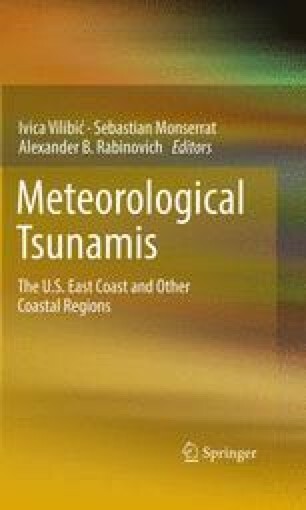 At last, the authors greatly thank Dr. Ivica Vilibic, Dr. Alexander B. Rabinovich, and Dr. Sebastian Monserrat for their endeavors to make the special issue on meteorological tsunamis come true. Furthermore, their leadership and contribution to this important topic is highly acknowledged.